I absolutely adore these harlequin heels! The perfect addition to your Autumn/Winter wardrobe. These beauts are100% Leather and also come in a Grey version too. Markus Lopfer has designed several slouchy sequined knits for TOPSHOP this A/W and they’ve totally flown out of our Flagship. A Black and Grey version with masquerade detail is also available in store. MARKUS LOPFER for TOPSHOP – Sequin lips Jumper in GREY. £85. 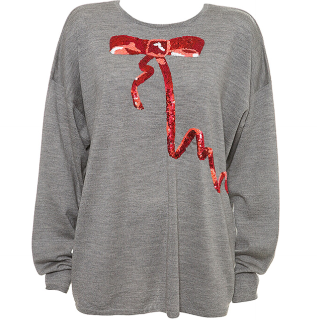 MARKUS LOPFER for TOPSHOP – Sequin Bow Jumper in GREY. £85.